Earlier this month, a report from Digital Music news stated that Apple Music had overtaken long-time streaming music leader Spotify in the category of paid stateside streaming subscribers (say that ten times fast). Both services have around 20 million paying subscribers in the U.S. Globally, it's another story as Spotify has 70 million members shelling out cash each month for its premium tier of service. The company, which went public earlier this year, has 90 million users who don't mind the limited features available with the ad-supported free tier. Apple has roughly 45 million global paid subscribers, and while it offers a three-month free trial, Apple does not offer an ad-supported level of service. 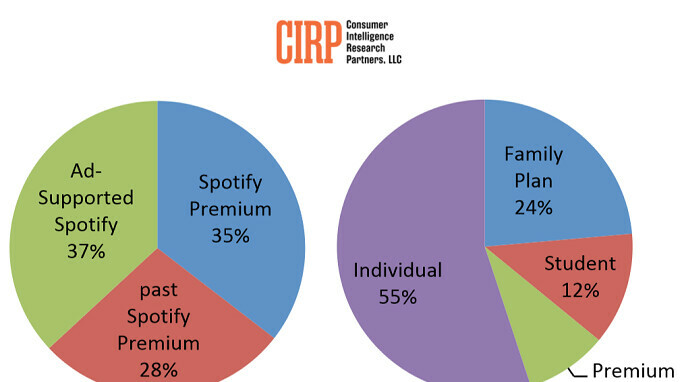 Today, research firm CIRP revealed that based on a survey of 500 U.S. Spotify subscribers, 35% of Spotify listeners in the states have subscribed to the premium version. 55% of the premium members pay $9.99 a month for an individual account, while 24% pay $14.99 to 29.99 each month for 2 to 5 family members. With the premium service, there are no ads, listeners get the ability to download music and play it back without an internet connection, and they receive unlimited skips. The premium service also allows users to request any song. Globally, a larger number of Spotify users opt for the premium service, according to Josh Lowitz, Partner and Co-Founder of CIRP. Lowitz says that in the U.S., Spotify has a lot more competition that will stream music for free or on a paid basis. What is higher in the U.S. is Spotify's premium churn rate of 16% for the last quarter, which CIRP attributes to that aforementioned fierce competition in the states. 16% of paid Premium subscribers ended a subscription, and either reverted to Ad-Supported Spotify or stopped using Spotify. Spotify would no doubt like to see more than 11% of free ad-supported members sign up for a premium service trial. The good news for the company is that once it gets consumers in the states to try the premium trial, it converts nearly three-quarters of them into paying premium subscribers. I'm a Canadian. Tried it for two days and went back to google play. Wasn't for me. I was part of that 74%. I found that Spotify really added value to my life so I continued to pay the subscription. Spotify is great, used it for years which makes it hard to change. Tried apple music but was awful at that time. Kept removing my music on my sd card back to storage constantly and each time I, cancelled my subscription, the app mysteriously reinstated it so they kept charging me. Why pay for a streaming service when YouTube is free?